Two measures authored by state Sen. Ben Allen (D-Santa Monica) were signed into law by Gov. 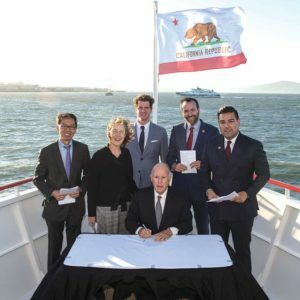 Jerry Brown at the Global Climate Summit on a cruise aboard the first plug-in hybrid electric ferry boat out in the middle of San Francisco Bay. The governor signed Allen’s Senate Bill 720, which requires environmental principles and concepts to be incorporated into the curriculum for K-12 students, directs the superintendent of public instruction to increase environmental literacy in schools and encourages governing boards of school districts to promote environmental literacy. Allen chairs the Senate Education Committee. The governor also signed SB 1016, which removes barriers to electric vehicle ownership by condominium residents by eliminating the requirement that they purchase a $1 million insurance policy on vehicle charging equipment installed at the condo complex. Allen chairs the legislature’s Environmental Caucus.